Hello everyone, I hope you're all well. I was really hoping to get this post up a few days ago, but I've been having a break in London with the family, so it's a little late! 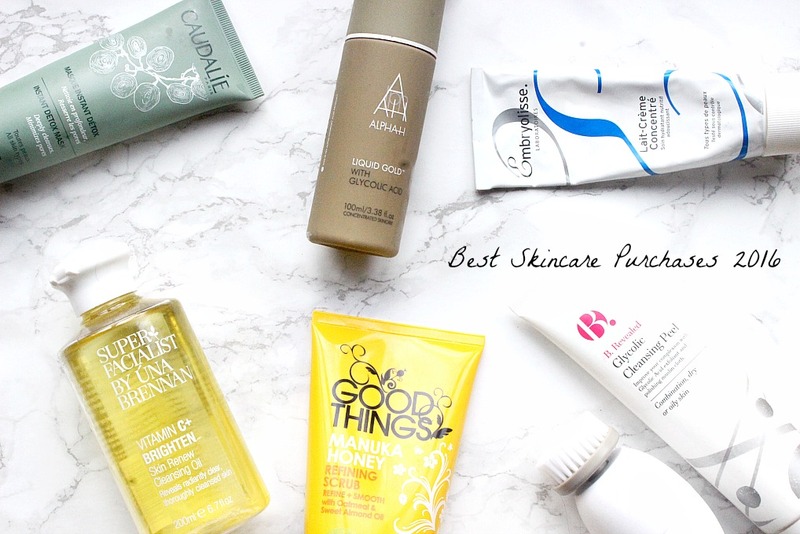 Anyway, the second part of my 'best of 2016' is focusing on skincare, and its been a good year for it! I have a lot of products to share with you all so I won't ramble on in the intro, on to the goodies. An oldie but a goodie on my blog, this is my absolute favourite way to remove my makeup because it quite literally melts it away. Although its kinda pricy for an oil, I find a little bit goes a long way and it really helps to hydrate the skin, whilst removing the majority of my makeup. Plus I only pick it up when its on special offer (which it is right now). Occasionally in the past few weeks I've been too tired to go through my proper cleansing routine, so I've resorted to using face wipes and my skin has really felt the difference. 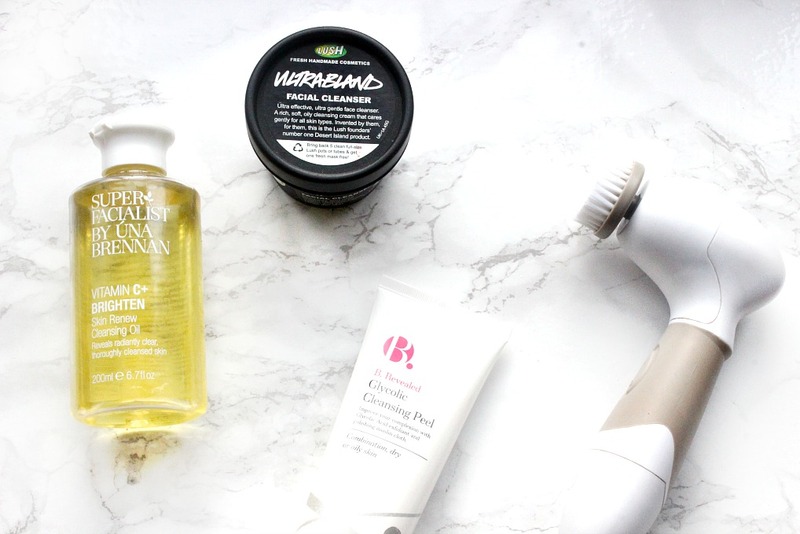 Without fail I have woken up with dry, tight skin that lacks any sort of hydration or glow. Honestly switching to a double cleanse routine was the best thing I have done and this oil plays a big part in that. I did recently pick up a cheaper oil cleanser though and if its as good, you'll be hearing about it soon, but for 2016 Una Brennan kept her crown! Vanity Planet Spin For Perfect Skin Brush | £80 £25! This brush has changed my skincare routine for the better, it is wonderful! I first saw it on youtube and so many vloggers were talking about it that I decided to give it a go - especially at the discounted price. I have the cheaper set, which includes 4 attachments, a cleansing, exfoliating, pumice stone and body brush. For the price that is fantastic and the depth of cleanse you get from this brush is EVERYTHING. Seriously its a game changer and I recommend for you all to purchase this, its worth twice or three times the price. I am currently not an affiliate for them so I can't offer you a discount code, however I believe in the brush so much that I've got in contact with them to hopefully become one, which speaks volumes cause I only back brands I am truly impressed by. Also luckily for you all they have a sale on right now, so no need to hunt down a code ^_^ Also cleansers that work best with this are cream and gel, my favourite to use is the manuka honey one, which I have raved about plenty of times so refrained from really including it haha. 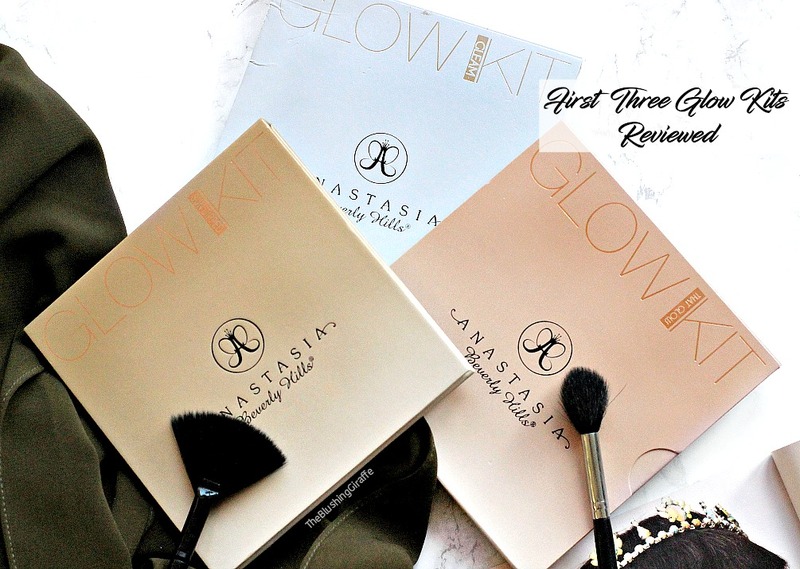 A well loved product that I finally decided to try at a Bloggers event this year. Now at first I wasn't mad about this, because its not your typical cleanser. It has a balm like texture, which is pretty waxy to touch and due to this whenever I tried to remove it, I always felt like there was a light layer left which would really annoy me. It also doesn't work very well with the skin brush, another thing that put me off a little! However if you use a warm flannel or soft cloth and gently remove it in circular motions, the skin is left feeling so incredibly soft, smooth and hydrated! The cleanser is created from lovely natural ingredients such as almond oil, rose water and honey too. I totally see the appeal now and tend to use it twice a week when I'm not using the facial brush, if you have sensitive skin I highly recommend it. This product is pretty new to my skincare routine, but it just about made it to my 2016 faves because I really do love it! A 2-in-1 product which contains glycolic acid, I find this cleanser really works well at brightening my complexion and leaving my skin looking fresh and feeling smooth. Mostly I'll use it as a typical cleanser, with either the face brush mentioned above, or a flannel (it comes with a muslin cloth by the way). However if my skin is looking particularly dull and tired, which has been the case when teaching and working long hours, I'll keep it one for the recommended three minutes as a quick mask. Don't leave it on for longer because I did once by accident and felt my skin start to sting. 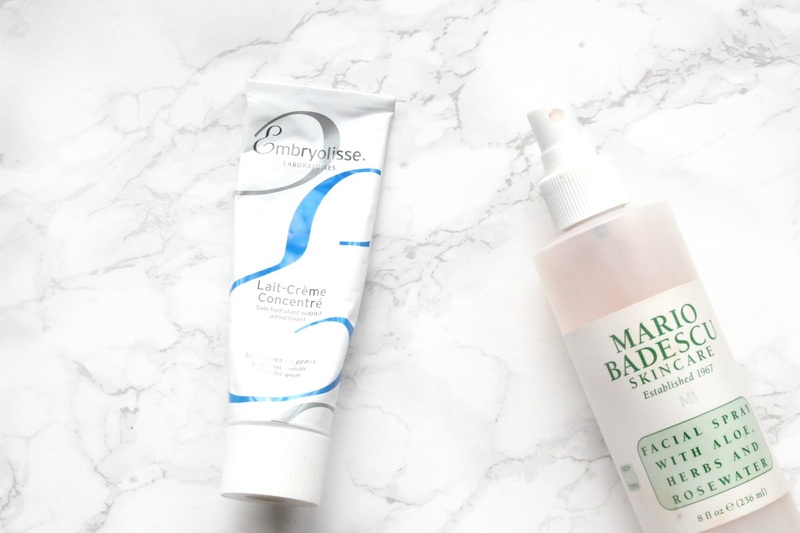 A fantastic budget cleanser (especially when theres an offer on!) which I recommend everyone to pick up and incorporate into their skincare routine a couple of times a week. Again another product which is relatively new to my skincare routine, but I love it! I wasn't actually surprised in the slightest that I would end up loving this because you might know that the cleanser in this line is a firm favourite. This scrub is gentle enough for sensitive skin, but it really does leave my skin feeling smooth. Although cleansing is an important step, using a softer scrub like this is what leaves my skin feeling squeaky clean. It really gets into the skin and removes impurities, plus the magic ingredient - manuka honey has so many skincare benefits, as well as the sweet almond oil and oats! Also this brand is usually on special offer, so not only is it effective and free from nasty stuff like mineral oils and parabens - its very very affordable too! Well 2016 was definitely the year that I discovered the benefits of using AHAs in my skincare routine! I picked this up as part of a special offer and instantly saw results after a couple of uses. I do think this is worth the hype, although I will say that there are affordable options out there now on the highstreet. 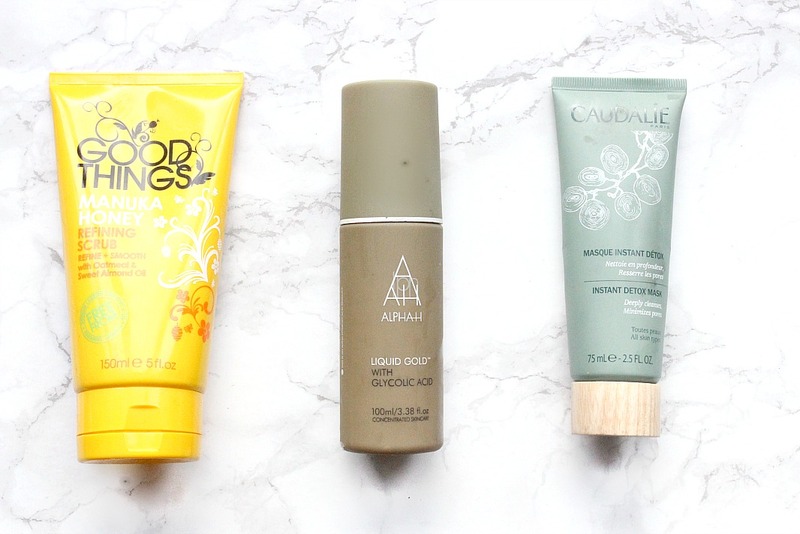 However nothing has given my skin the same results as liquid gold, it evens out the skintone and makes my face look brighter. I did stop using it when I was using my IPL machine on my face, but recently I broke out quite badly (for me), so I'm excited to get back to using it and hopefully seeing my dark marks fade away. My favourite 'easy' clay mask by far! This was a recommendation by a lovely friend and reader of mine, and I'm sooo glad she let me know about it, because its the good stuff. Although its a clay mask, its very comfortable on the skin and I love how detoxed my skin feels after using it! One of those masks that definitely do something great with one use and I will be repuraching this as soon as its empty, its just that good. Back to products I use everyday, I have fallen head over heels with this moisturiser. Initially I purchased the 30ml because I didn't want to spend such a large amount on a base, however I soon realised that it is worth all the hype and more! Nothing prepares and hydrates my skin better and a little goes a long way, so one tube will last me months on end. I have tried other moisturisers here and there, but always come back to this. Theres a reason why makeup artists swear by the stuff! I've written a whole review dedicated to this, so I won't go on and on but in short: ESSENTIAL. I spray my face with this every day, makeup or not. The past few days I spent in London with my family and I was recommending it to everyone, aswell as giving their faces a healthy spritz too. Not only does it hydrate and add a subtle glow, but it gets rid of all powderyness too! Yes its way better than MAC Fix+, but anyway I have properly reviewed it linked above, so have a read if you want to find out more. What have been your standout skincare products from 2016?